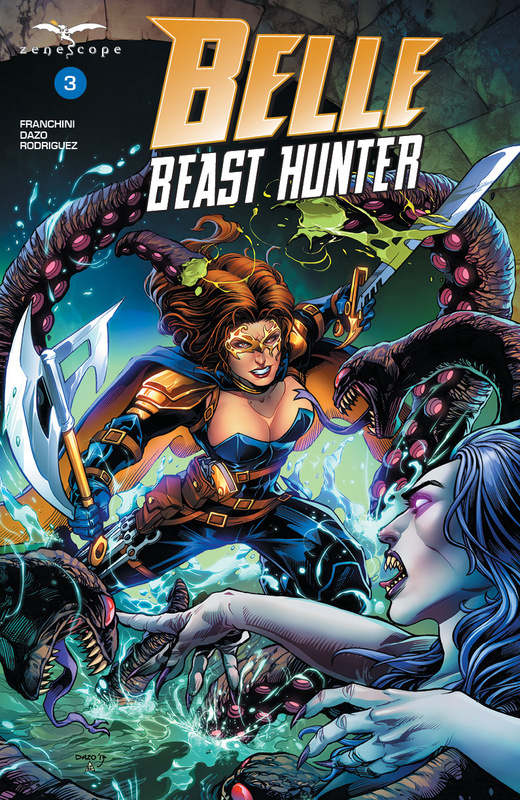 The third issue of Zenescope’s latest fictional princess turned badass, Belle the Beast Hunter will be released on April 18th. Most recently, the prior issues found Belle reeling after an intense attack from an unknown monster, unfortunately costing her a casualty of the highest capacity, Belle’s long term friend and mentor, Mr. Candlestick. The end of issue two ends with a cliffhanger moment; Belle, after a vicious fight with a Medusa like creature, wakes up in a bed that is not her own in a location she is unfamiliar with, her first interaction being with an older woman telling her she must get ready to fight in an impending war. In issue three, we are immediately introduced to the mysterious older woman, Patricia Otts, who happens to be the sister of Mr. Candlestick. In this issue, we learn that the hunting intelligence agency Patricia works for, Cryptid Hunting Intelligence Program, or C.H.I.P., is preparing for an attack of the highest magnitude. As with the prior issues, issue three is packed with a lot of sarcasm, plenty of action and some splattering of random violence and gore. I think my favorite thing about this series is the obvious nods and homage it plays to my favorite Disney princess. Patricia Otts is obviously a nod to Mrs. Potts in the Disney film, and the location to the movie’s Mrs. Pott’s son, Chip. That being said, that fact, certainly far from makes up the problems I have with this title. Unfortunately, the writing, done by Dave Franchini, falls flat and does very little to give you a multi-dimensional, relatable character. 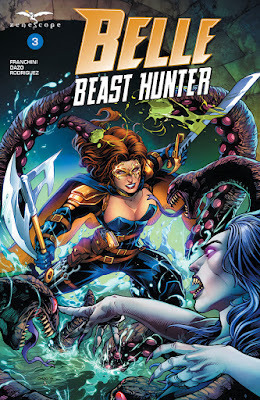 I have mentioned in reviews of other Zenescope titles that I find the heroines within to be very repetitive and seem like the same character over and over again, but with slightly different appearances, and Belle is no exception. The attempts at over the top sarcasm seem forced and sadly, once again, we are presented with a female character that suggests the writer either has only interacted with one type of woman ever or has little to no interaction with women on a regular basis. When it comes to the Zenescope titles, it almost feels like they realized that the “damsel in distress” trope was officially outdated and creating strong, powerful, baddass female characters was now what the comic reader audience desired. Though I appreciate the sentiment, regrettably, instead of creating truly impressive female characters, they essentially just traded one writing trope for another. I feel that Zenescope would benefit from hiring more females within the industry, both writers and artists, to assist with this problem. I’m certainly not stating men cannot write good female characters, but when presenting the same character and material over and over again, it’s clear that their team needs some assistance, and there is nothing wrong with acknowledging and trying to correct that. There is no mistaking that Zenescope employs talented men to draw their titles. Bong Dazo continues to lend his hand to Belle the Beast Hunter and the art continues the momentum from the earlier issues. I must say the detailed, surreal surroundings, over the character art, are my favorite part of his work on this series. I find the scenes where we see monsters are certainly where his talent shines as they are definitely memorable. I wish there was more depth and characterization that went into the main characters in this title, as I found both Belle and Patricia to lack much detail in this particular issue. The colors, done once again by Juan Manuel Rodriguez remain bright, vibrant and pack a punch. That being said, and certainly at risk of sounding like a broken record, the art feels like very much of the same. I could pick up several different titles that Zenescope is putting out and have a hard time distinguishing many differences in characteristics of the art. The women all look the same, save for different hairstyles and clothing and I simply wish there was more variety. That being said, as they continue to put out these titles with little variation, it must be what they have found works for them. Is Belle the Beast Hunter the worst comic ever? Certainly not. Is it terrible? It’s really not terrible. Is it exciting and memorable with a story that leaves you anticipating the next issue and wanting more? Unfortunately, again, the answer to that is no. Writing a story about a much loved character who has graced stories and movies for decades can be extremely risky; much riskier than writing an original character, in my opinion. Belle the Beast Hunter just doesn’t do the lovable character the justice that she deserves. The series, though it has potential with such a great character, continues to get flatter and more predictable with each issue. When I initially picked up issue one, I was so excited to read it, as I mentioned above, Belle has always been a favorite character of mine, and sadly I have been let down once again. The writing team needs more diversity in order to create more diverse, multi-dimensional characters that will appeal to a wider audience; it’s as simple as that.